I believe in one God, the Father Almighty, Maker of heaven and earth, and of all things visible and invisible; And in one Lord, Jesus Christ, the Son of God, the Only-begotten, Begotten of the Father before all worlds, Light of Light, Very God of Very God, Begotten, not made, of one essence with the Father, by Whom all things were made: Who for us men and for our salvation came down from heaven, and was incarnate of the Holy Spirit and the Virgin Mary, and was made man; And was crucified also for us under Pontius Pilate, and suffered and was buried; And the third day He rose again, according to the Scriptures; And ascended into heaven, and sitteth at the right hand of the Father; And He shall come again with glory to judge the quick and the dead, Whose kingdom shall have no end. And I believe in the Holy Spirit, the Lord, and Giver of Life, Who proceedeth from the Father, Who with the Father and the Son together is worshipped and glorified, Who spoke by the Prophets; And I believe in One, Holy, Catholic and Apostolic Church. I acknowledge one Baptism for the remission of sins. I look for the Resurrection of the dead, And the Life of the world to come. Amen. 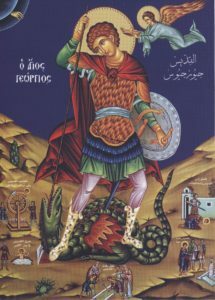 Saint George was born about 250 A.D. of noble Christian parents in Cappadocia. He excelled as an officer in the Roman army. During the persecutions against Christians by the Roman emperor Diocletian, St. George courageously confessed his faith in Christ before the emperor. Consequently he underwent many tortures and in the end was beheaded. Because of his many sufferings as a martyr for Christ, he is called the “Great Martyr.” The Eastern Orthodox Church honors St. George among the greatest of martyrs, and we celebrate his feast day on April 23, the day of his martyrdom. Orthodox iconography typically depicts St. George riding a white horse symbolizing God’s grace carrying him to the heroism of martyrdom. He is shown battling the devil, symbolized by a dragon. The first Syrian and Lebanese immigrants arrived in Minnesota in the 1890’s. In the St. Paul area they settled primarily on St. Paul’s West Side. Dating from the arrival of the first Orthodox immigrants in St. Paul, they were informally organized as a religious group. Services were held in the home of Mr. George Toby by visiting priests from other Orthodox Churches. In the early days, the Syrian Orthodox were visited on at least three occasions by their Bishop, the newly canonized St. Raphael Hawaweeny. St. George Syrian Orthodox Church was formally organized and founded in 1913 on St. Paul’s West Side by Syrian immigrants. An Episcopal Church located at Clinton and Isabel streets was purchased and adapted for Orthodox liturgical needs. A few years later a house adjacent to the church was purchased for use by the parish priest. A parish hall was also purchased a few blocks away from the church. The church was officially dedicated in 1915 by Metropolitan Germanos Shehadi, at which time our first parish priest, Reverend Elias Sady, was ordained. Since then many priests have served our parish, among them: Rev. John Karsha, Rev. Andraous Nassar, Rev. Baselous Nader, Rev. Elia Hamati, Rev. Seraphim Nassar, Rev. Peter LaZar, Rev. Michael Deeba, Rev. Baselous Mafouse, Rev. Gerasemos Yared, Rev. John Chrysostom, Rev. Thomas Skaff, Very Rev. Essa Kanavati, Rev. Gregory Reynolds, Rev. Daniel Simon, Very Rev. John G. Khoury, Rt. Rev Archimandrite John Mangels, and currently the Very Rev. Father Thomas Begley is serving our parish. As the church building on the West Side began to deteriorate and parishioners moved out of the area surrounding the church, five acres of land in the suburb of West St. Paul were purchased in 1968 for a future complex. The old church was acquired by the St. Paul Redevelopment Authority. Also, about this time a major reorganization took place in the governing of the parish. Our first parish Council was organized, replacing a men’s society form of governance which served our parish well in earlier times. All of 1972 was spent planning with an architect for a multipurpose building to be used for worship and social purposes, with a special section for religious education. The multi-purpose hall was constructed during 1973 and our first service was held in February 1974. The second phase of our building program was completed in 1975 with the construction of a new parish home adjacent to our multi-purpose building. The third phase of our building program began in 1980 with a year of planning and meeting with our architect, E. A. Sovik. It was our goal to design a Byzantine-style church in keeping with Orthodox tradition while also blending in the best of 20th century concepts. Construction of a new Byzantine-style church began in 1981. The church seats approximately 300 people and includes a beautiful gold dome, an icon of Christ in the dome painted by iconographer Rev. John Matusiak, assisted by Father John Khoury and parishioner Jo Anne Droubie. Our first service in the new church was held in March 1982, with the official consecration on September 11, 1989 by His Eminence Metropolitan Archbishop Philip Saliba. 1998 brought about the unification of the two Antiochian parishes in St. Paul. St. Mary’s Parish on So. Robert St. and St. George were formally united in a single Antiochian witness with the blessing of Metropolitan Philip. Father John Khoury retired after 30 years of service to the community of St. George. With the joining of two communities there was need for a major expansion of the facilities. In 2001 a large new parish hall was built and the former hall was enlarged and completely rebuilt to accommodate a fast growing church school program. An administration complex was also configured out of the former hall and kitchen area. A magnificent dedication service was held in May of 2002 and a new Altar was consecrated in the newly redecorated church. In 2006 we were blessed with the arrival of our current pastor, the Very Reverend Archpriest Father Thomas Begley. The St. George parish family is made up of many of the descendants of the original Middle Eastern families. We are also home to a sizeable number of immigrant families from Lebanon, Syria, Jordan and Palestine. St. George is also home to faithful from other Eastern Orthodox backgrounds. We boast a great many converts who have searched for, found our faith, and made it their own.